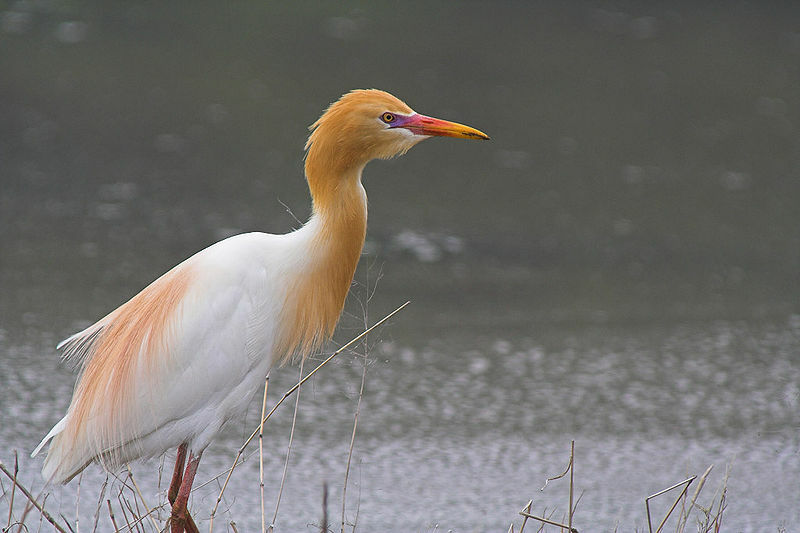 The Cattle Egret has obtained its name by being often guests in pastures and other places near large herds of cattle, where the birds feed on small creatures that try to run from the cattle herds. This species differs from other Egrets in both appearance and behaviour. 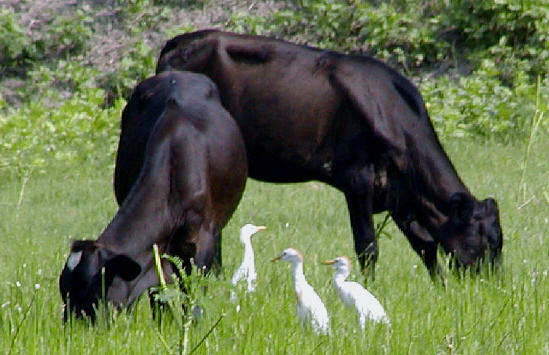 The Cattle Egret looks for food in meadows, often far from freshwater sources. The bird has a short, muscular neck and when walking, the Egret looks clumsy, unlike the other Egret species that are always elegant and majestic. These birds are medium-sized, reaching a length of 48-53 cm, with a wingspan of a little less than 1 meter. In winter, both the sexes appear almost identical, with a creamy plumage, while the females’ tends to be a bit lighter. During the rut period, however, males display spectacular yellowish-orange feathers on their heads, chest and back, while the beak becomes almost red. Cattle Egrets are widespread all over the world, with populations in south Europe and Africa, central parts of the USA, South America, as well as Australia and parts of Asia. Unlike most Egrets, this species doesn’t necessarily have to live in humid areas. Cattle Egret spends most of its time in meadows or other open areas. They also have no fear of humans, thus are often guests in parks and even larger gardens. Cattle Egrets live in flocks of up to 20 specimen. Early in the morning they leave their nests in trees or branches, and start looking for a cattle herd. In the evening the group comes together again and finds a place to drink. It’s interesting that Cattle Egrets don’t mind other bird colonies in their territory, and there can be up to 100 bird nests in a single tree. Every day, the Cattle Egret flies to a cattle herd, and spends the day feeding on bugs, spiders and other small animals that have been aroused by the large mammals. 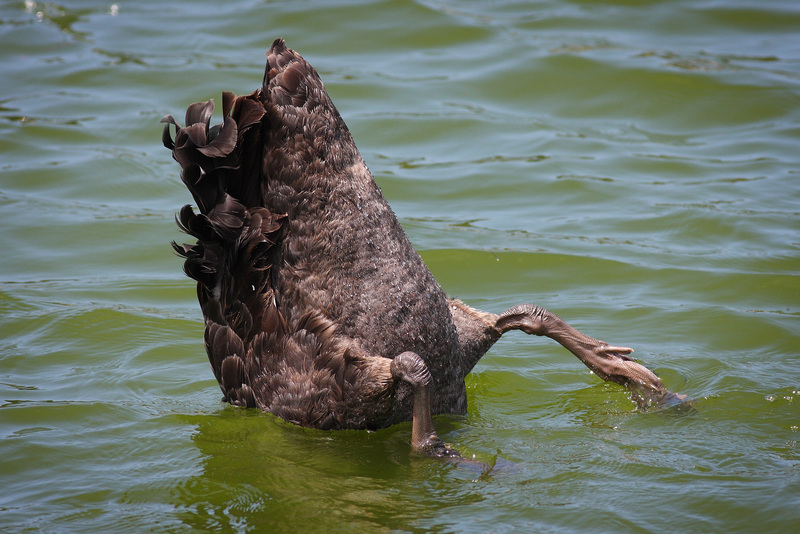 The birds also sometimes sit on the animal’s back and look around for possible prey, or pick off ticks from its back. A delicacy for the Egrets is locusts – when locusts swarms appear in steppes and meadows, a lot of Cattle Egrets are sure to arrive, too. The males, who are usually quite passive, become very loud and aggressive. The male finds a secluded place and starts showing off by stretching the neck and wings. About 10 females observe the male for quite some time, and later the male can choose one of them to mate with. 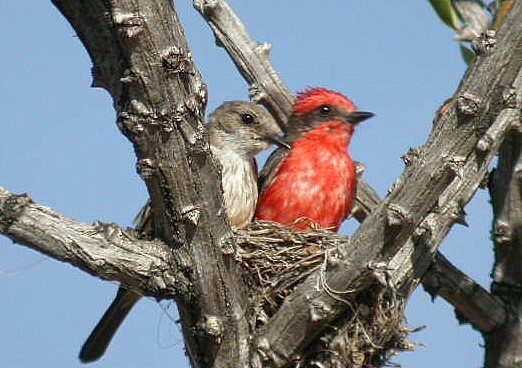 After copulation, the pair finds a place for nesting – small trees, bushes or water plants. Both the parents incubate eggs, and the chicks hatch after 24 days. Thirty days after hatching, the young Egrets start flying, and in 15 more days they become completely independent. Having a life expectancy of about 13 years, and holding strong populations in almost all parts of the world, Cattle Egrets are not facing extinction.